No matter if it is in your personal everyday life or at work – if you feel distressed and have the feeling that there are more and more stressful situations, you are not the only one who feels that way! Different studies of health insurances prove that the pressure people feel, increased: That can lead to very dangerous effects! Learn how to prevent burnout, how to deal with the everyday life stress and be relaxed, even in highly stressful situations! We show you techniques to relax, as well as useful knowledge, that will help you to understand what exactly stress is and what the triggers are. Start now and experience the huge gain of life quality! No matter if it is in your personal everyday life or at work – if you feel distressed and have the feeling that there are more and more stressful situations, you are not the only one who feels that way! Learn how to prevent burnout, how to deal with the everyday life stress and be relaxed, even in highly stressful situations! Gain insight to your stress level and your ability to regenerate. Fight stress effectively – with fitbase! 3 steps to a relaxed everyday life – we show you which! Every course unit includes a theoretical and a practical part. You will receive important information for topics, such as “What is stress?” or “How can I relax at my working place?”. Additionally you will get workout exercises to support a more balanced and even-minded everyday life. Take your destiny in your own hands! How can I become calmer? The main goal of this course is to enable you to deal more confident with stress to prevent the longtime negative effects of stress. In order to get a better overview about the changes in your ability to deal with stress, you can do a check up to determine your personal level of stress. We present you exercises from different topics, such as relaxation, self-management, yoga and movement, using mp3 and video. Morepver, you will have access to different maditation exercises. Using our telefon coaching gives you the opportunity to talk with an expert about your personal stress sources and effects. Each week a new course unit, each lasting 60 min. Know-how from experts, phone coaching and hints for your everyday life! 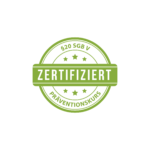 The course stress management and relaxation intensive is certified by German law(ID: 20180622-1021714) and the public health insurances refund up to 100%. Please choose your health insurance and we will show you, how much you can get refunded. This oline course grounds a concept for a healthy back. You have always full access to all contents of the course unit and you can monitor your personal progress. Duration: 10 weeks. A new course unit gets unlocked every week. *Get up to 100% refund – no prescription needed. The online course for stress management is based on the concept “relaxed and safe in stress”. Each unit consists of a theoretical section, which is supplemented by application tasks, practical exercises for the adjustment to the health unit, and a final part with relaxation exercises. Duration: 10 weeks. A new course unit gets unlocked every week. Each course unit contains 60 minutes of exercises, theoretical parts and techniques to relax. Get fit and active – we back you up! Duration: 8 weeks. A new course unit gets unlocked every week. 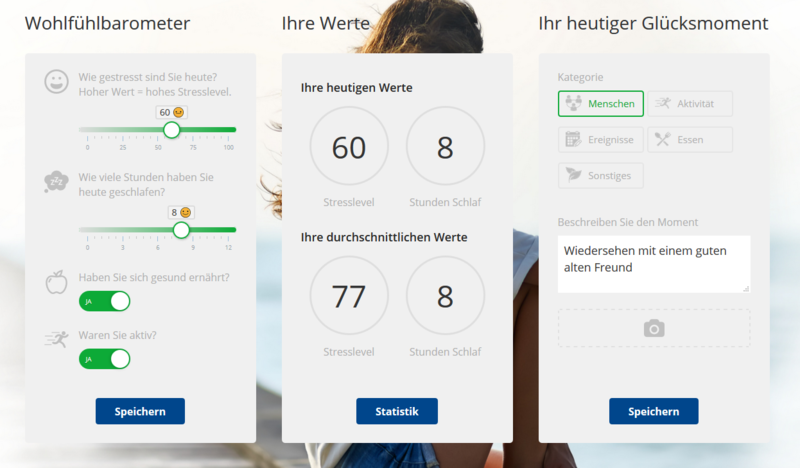 Mindfulnes – your way to a satisfied everyday life. We provide you with useful information, as well as effective exercises and techniques to improve your personal mindfulnes. Open your mind – we support you! Duration: 8 weeks, each course unit contains 60 minutes of exercises and theoretical parts. A new course unit gets unlocked every week. You want to eat clean and healthy but you struggle to put things into action? videos of how to cook specific meals. Duration: 8 weeks. A new 60 minutes course unit gets unlocked every week, including information, exercises and 2-3 videos for including receipes to follow. This online course grounds a holistic concept to deal with stress in general and especially with higly stressful situations. You have always full access to all contents of the course unit and you can monitor your personal progress. Duration: 12 weeks. A new course unit gets unlocked every week. Disburden your back and yourself! private, at work or your everday life! Get fit and active – with fitbase! For whom are prevention courses suitable? Everyone can participate. All you need is Internet access for accessing the course content and an e-mail address so that we can remind you of the next unit. You will also receive a certificate confirming your participation. After completing a course, you will automatically receive a confirmation of your participation, which you submit to your health insurance. The prerequisite is that you complete the 10-week course in a maximum of 14 weeks and the 8-week course in a maximum of 12 weeks. What if I am sick or on holiday for a week? No problem! You simply pick up the appropriate unit as soon as you can. You have a total of four weeks to postpone. How often do I have the right to a prevention course? Most statutory health insurance funds reimburse the costs for two certified prevention courses per calendar year. For more detailed information, please contact your health insurance company. How much time should I plan for a course? On average, the course units last about 45-60 minutes. Because they are online courses, you do not have to complete all components in one sitting , but you can also split them into shorter sessions – and even pause and finish later . How can I view exercise videos in full screen? To view our exercise videos in full screen, simply click on the full image icon in the lower right corner of the video player. Press the Esc key to return from the full screen to the small view. You can repeat the exercise as often as you like, according to your individual needs. There is no guideline here. Can I save or download course content? After each session, you have the option to download the contents of the session as a PDF file.